Grapefruits are in season this time of year, and ginger adds warmth to cold-weather desserts. Both are ingredients I associate with winter, so I thought: why not combine them in one dessert? 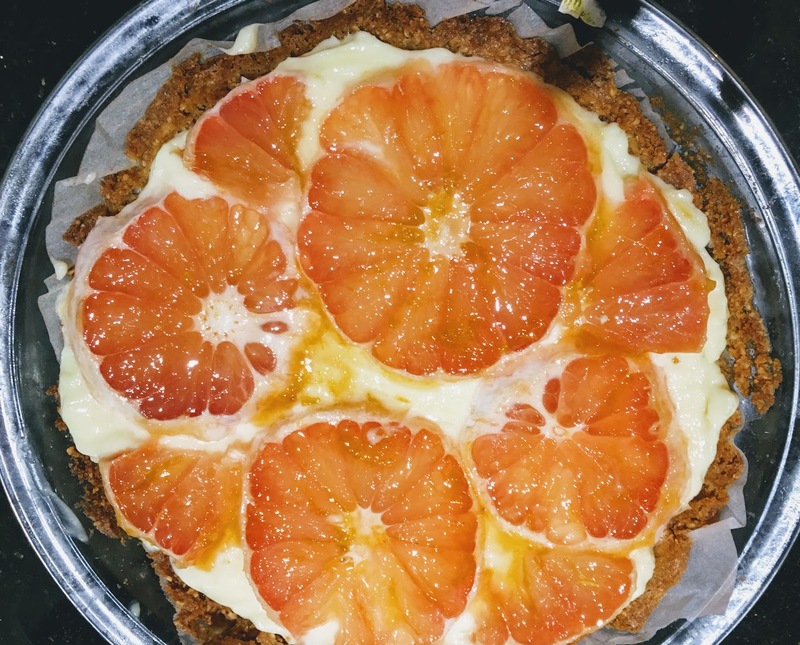 The result was my take on a classic French fruit tart, with a ginger-almond crust, layer of vanilla custard, and slices of fresh grapefruit. To tie everything together, I glazed the grapefruit with apricot jam and freshly grated ginger, allowing some of the glaze to spill onto the custard for added flavor. With fresh fruit and chilled custard, it’s a far cry from traditionally warm and cozy winter treats (think puddings, gingerbread, cinnamon rolls, and brownies) but makes great use of seasonal ingredients and flavors. Almonds add texture and richness to the crust, but feel free to substitute oats if you have a nut allergy. Prepare the filling: The filling can be prepared a day in advance, or an hour or two before baking the pie crust. In a large mixing bowl, whisk together egg yolks and milk until smooth. In a medium saucepan, combine sugar, salt, and corn starch. Very slowly pour milk mixture into the saucepan, stirring continuously to prevent lumps from forming. Cook mixture over medium heat, stirring continuously for around 20 minutes, until mixture thickens and begins to boil. Let boil for one minute, continuing to stir, then remove from heat. Stir in vanilla extract. Transfer to a container (I used a long, shallow Tupperware container to ensure faster cooling.) Cover top of the custard with plastic wrap to prevent skin from forming, and set aside to cool. Once fully cool, store in refrigerator until ready to use. Prepare the crust: Preheat oven to 350 degrees, and butter a 9-inch pie or tart pan. Line the bottom and sides with parchment, and butter the surface of the paper. Place almonds in the bowl of a food processor, and process until finely ground. Add flour, salt, sugar, and ginger (if using oats instead of almonds, add them here) and pulse until combined. Add butter, and pulse until a dough just barely comes together. Press the dough into the bottom and up the sides of a prepared pie or tart pan. Bake for 25-30 minutes, until middle is golden and edges are deep golden brown. Set aside to cool. Prepare the glaze: In a small saucepan, combine apricot jam, water, and ginger. Over medium heat, cooking until mixture just begins to boil. Stir and remove from heat. Assemble: Spread one cup of custard evenly over fully cooled crust. (There will be custard left over. You can serve it with fresh berries, or use it to fill another tart, cream puffs, or doughnuts. It will keep in the fridge for around 4 days.) Chill in refrigerator so custard sets. The tart will come out fine if you skip this step, but may be a bit messy when you cut it. Peel grapefruit and remove bitter pith. Using a serrated knife, cut the grapefruit crosswise into thin slices. Feel free to get creative when decorating: layer on whole slices, or cut the grapefruit into smaller wedges and arrange in a nice pattern. I went with a rustic look and used a combination of both whole slices and smaller sections, letting some of the custard show through. Brush grapefruit with apricot ginger glaze. Serve immediately, or wrap in tinfoil and refrigerate.